It’s habit-forming, that 200-degree radiant heat Russian room. In the corner sits the furnace, an enormous stone room with a full-sized metal door. It looks positively medieval. Make your way up to the top of three tiers of benches that line the room and your nostrils will start to burn. Try to take in a full breath and you’ll wind up hacking. Sit a little lower and your body will start to acclimate. Your skin will glow. And then, the schvitz. Sweat breaks out over your entire epidermis at once. Don’t stay in here over 30 minutes at a time, the sign on the door warns. When you’ve had enough, grab a bucket of water and douse yourself. Dip a towel and wrap it around your head. Or exit the room, kick off your rubber slippers, and drop into the ice-cold plunge pool. This is not a Tribeca spa. This is not a place for people who are finicky about hygiene. This is a remnant of the Old World, of the East Side before gentrification. “If you come to the Russian and Turkish Baths expecting soothing balms, thick towels, and gentle ministrations of flower-scented infusions, head elsewhere,” writes a contributor to a recent guidebook to “hidden” New York, edited by the folklorists who run the non-profit City Lore. 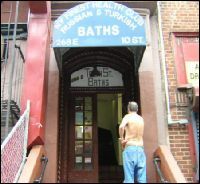 The 10th Street Baths have stood here, perched on the edge of Alphabet City, since the 1890s. Originally heated by coal, the furnace room now runs on gas. You can choose between three principal spaces: the “radiant heat” Russian room, a tiled Turkish steamroom scented with eucalyptus oil, and a Swedish sauna filled with the smell of its own cedar benches. But it’s the intensity of the Russian room that calls you back more than anything. Once the sweat starts you feel like you’re being cleansed from the inside out — like whatever poison this modern world force feeds you is being purged, your blood refined, your lungs cleaned out by hot air. By the end of the night, you’ll sit on the top tier and inhale deeply through your nose. Your nostrils will still burn, but you can take it. The rooms empty and refill periodically as patrons move from space to space, mostly in couples or small groups. Each recombination is different. You have old schoolers — older and younger Russians or the children of Russians. Each has his or her own peculiar rituals: a towel on the head and one over the shoulders; a bucket at the side for periodic sprinkling of the face; a full bucket over the head as you enter or exit. One stout woman keeps a water bottle cool by covering it with a wet towel. Another woman, younger, her arms thin as flexi-straws, looks like she just may live here, sweating ounces in small increments until she’ll eventually be whisked down the drain. Later she’ll be sitting on the side of the cold pool shaving her legs. A 30-something Russian woman walks into the Russian room, her Hawaiian boyfriend in tow. A masseur prepares a makeshift bed on the top tier — soaks it with cold water. “It’s his first time,” the girlfriend tells the masseur. The masseur wears a t-shirt and keeps his head wrapped in a wet towel, I Dream of Jeanie-style. The boyfriend has a tentative string of Chinese characters running down one of his arms. Once he’s lying face down on the soaking towels, the masseur digs in: a brutal hand and elbow massage, some forced deep stretching of legs and shoulders, followed by a platza beating with a broom of oak leaves. Every few minutes the masseur douses himself with a bucket over the head, saves a little for the patron. When he’s finished, he leads the guy out to the cold pool and nudges him down the steps. There’s a ritualistic feel to the whole enterprise that makes me want to keep up these monthly visits with friends, at least through the winter. If I’m going in for rituals, I prefer ones like these that have symbolic and material bases all at once. I like the communistic charge of exchanging your clothes for the one-size, unisex shorts. I like that the towels aren’t fluffy, that the place won’t tolerate snobs. I like the descent below street level, a movement into the fiery furnaces of the underworld and a resurfacing at the end. I like the idea that you’re sweating out stress, inhibition, ambition, uncertainty. Modernity. All melt and slip away beneath the radiant heat. But all these metaphorical aspects of the schvitz — and this is the part I really like — are rooted in something that physically happens to your body, something that leaves you, when you walk back home in the nip of the winter air, feeling like you’ve literally shed your skin, and the new one’s not quite fully formed. Holy Cow, is it really 200 degrees, and for $30. no less? The steam-room in my local YMCA is seems almost too hot at 112. Even without steam, 200 degrees seems like you would just need a good basting, to brown like a small cornish game-hen. I really liked the line “Another woman, younger, her arms thin as flexi-straws, looks like she just may live here, sweating ounces in small increments until she’ll eventually be whisked down the drain”. What a great post (again)! ah, yes. 200 degrees. you do feel like you’re cooking a little. or like you’ve been tricked into being there and you’re just waiting for the witch to pop out of the little metal door and eat you. Super evocative as usual, Bryan. I was so jealous when you told me a few weeks ago of your pilgrimage here with all those GWers! When I lived in Germany I used to go to a place like this called “Schwitzkasten,” which translates literally to “sweat box,” so when I read your title I had a feeling this was your topic. Schwitzkasten was a bit more deluxe than what you describe here, with outdoor pools surrounded by grass as well as indoor saunas–but I have also been to a hammam in Fez where the local women were so dumbfounded that I had my own bar of soap and comb that of course I gave them away instantly. Then an elderly Moroccan woman came in and scrubbed my skin so raw that it was peeling off in strips in the steam, as she poured buckets of hot and cold water over me in interims. A very intense experience, especially since I couldn’t communicate a word, and very memorable. I hope to test drive your Russian baths with y’all next time. hey guys. so this afternoon i was chatting with the person i’d mentioned (the friend who said the baths were more his dad’s place & not so much a place he’d really wanted to go when he was younger). he told me that his dad said that back in the day all the employees were deaf. apparently the mobster types who did deals there wanted total security for their conversations. btw, i love the stories about comparative bath house experiences — travels, etc. someday i’d love to wind up in russia with parrish, dave, bacon, and our other russian speaking friends. that would be a blast. i also forgot to mention that a certain bearded TGW editor we know looks a bit like john the baptist or some other prophet in the funky robes they distribute. it’s been many-a-time that chloe and autumn and i, have gone to the korean day spa on olympic in mid-town. it’s a cheap price for your own little robe and options of hot pool, cold pool, tea bath, dry sauna, steam sauna, and oxygen room. but the best part is after we’re all steamed and pruny, there’s a gigantic slab of heated jade and clean blankets where we go to nap, gossip, laugh, and read US weekly. ah, i love these times!! you can pay a bit extra to get a scrub by a “korean mommy” (as we’ve dubbed them) where you get flipped around and scrubbed in all sorts of “right there” sort of places. you certainly can’t have much shame, but you really kinda feel like your mommy is rubbing you down, no judgement, no innuendo. autumn and i have gone every year on oscar night and time it so that we’re on the heated jade with our blankies at least by 8:30 so that we can get some of the final awards in (and have a somewhat informed opinion on the night’s fashion). it’s an all-women spa, guys. sorry. My friend Fin took me to the RT Baths the last time I was in NY. I remember that it was cold and drizzling that day and we made it to the main entrance on a Friday late afternoon. I didn’t know what to expect, I had been warned that the place would be co-ed and basic. It all seemed very New York to me once we got downstairs. That 200 degree, three tiered hot box, was like nothing I’ve ever seen – bodies slack and limbs stretched out so as too keep the least amount of skin touching. I think I lasted ten minutes at most, with a cold water drop (or maybe two). I kept pulling at my too big men’s shorts and sliding in my too big rubber sandals, but the minty steam after my cold dip and the cute old man all hunched in the corner kept me smiling. My favourite part…the back deck where we laid still and steaming in silence watching the days light relax into darkness. just beautiful, and you brought it all back. thank you.